ONE: In a small container, mix 1 tsp. rose clay into 1 Tbsp. isopropyl alcohol. 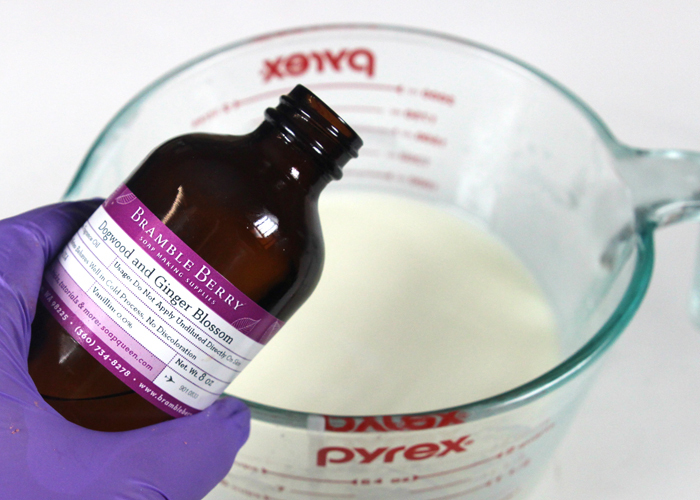 This will help the clay mix into the soap without clumping. Cut 4 oz. of Clear Melt and Pour into small, even pieces. Place the soap in a heat-safe container and melt on 5 second bursts. Using short bursts prevents the soap from burning. Add 1 Tbsp. of dispersed clay and mix to fully incorporate. THREE: Spritz 99% isopropyl alcohol into the mold details. This will help the soap flow into the details more smoothly. 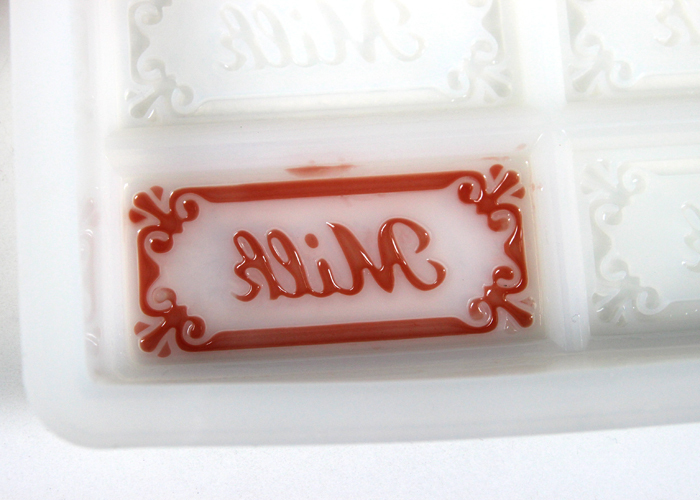 Using the Injector Tool, begin piping the soap into the border and “milk” lettering. Have a cup of hot water nearby to clear out the Injector Tool during this process. If the soap starts to harden while you’re filling in the details, pop it back into the microwave for 5 seconds. When the details are full of soap, spritz again with alcohol to get rid of bubbles. The details are small, so soap may go outside of the lines. Don’t worry – you can clean that up later. 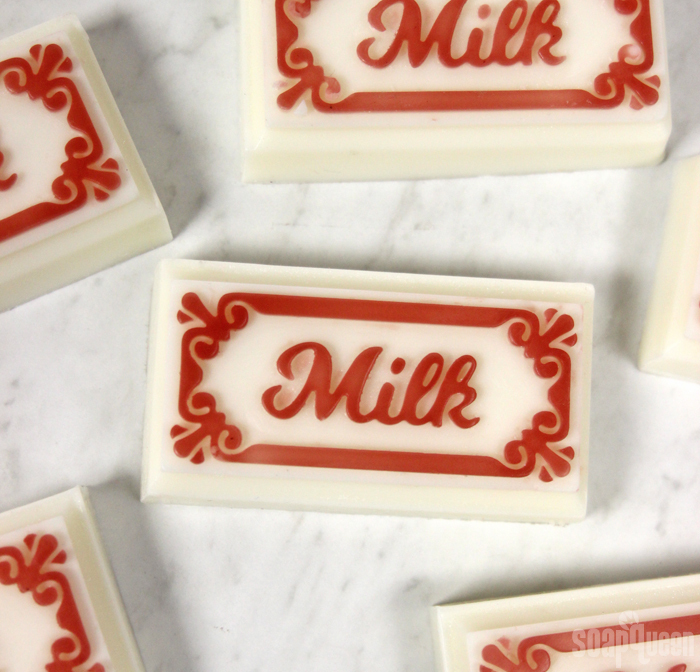 You will have a few ounces of leftover red soap. 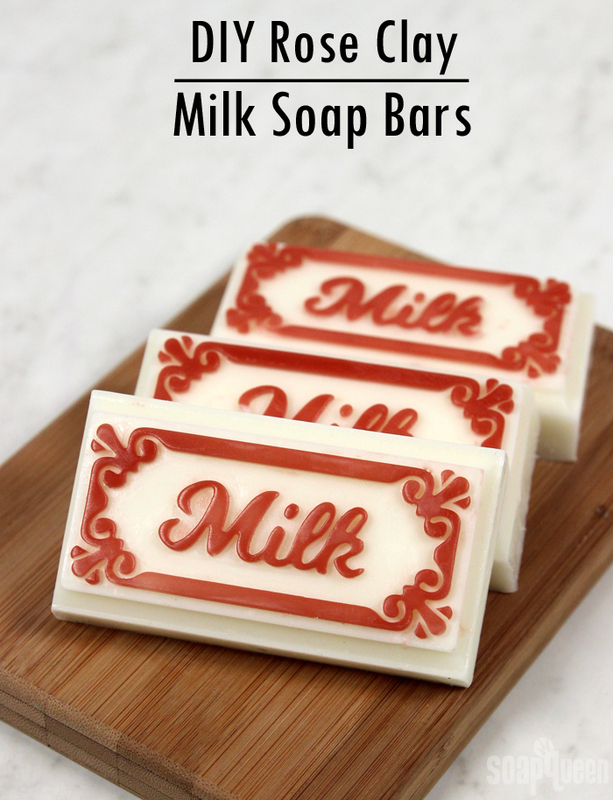 Pour any excess soap into a separate mold. FOUR: When the soap is firm – after about 5-10 minutes – use the Clean Up Tool to remove any spills. FIVE: Cut 32 oz. 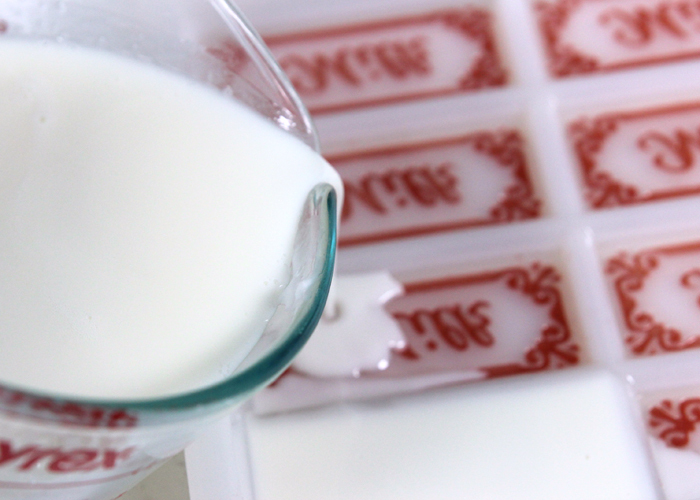 of Goat Milk Melt and Pour into small, even pieces. In a large heat-safe container, melt the soap on 30 second bursts. Add 0.9 oz. of Dogwood and Ginger Blossom Fragrance Oil and stir to fully incorporate. 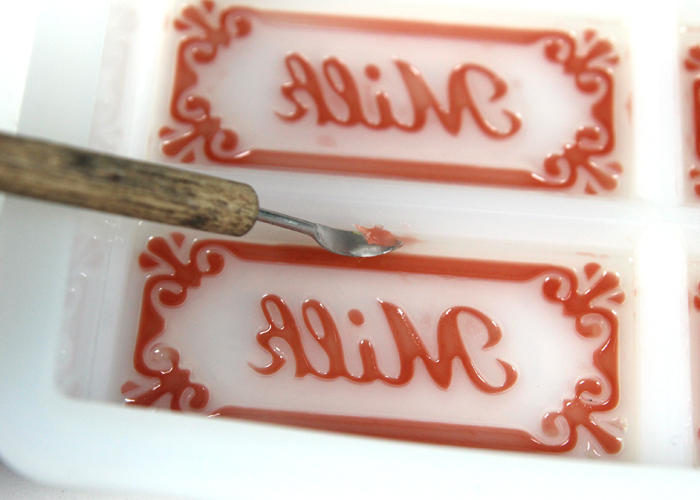 Wait until the soap is around 125-130 ° F so it won’t melt the red soap below. 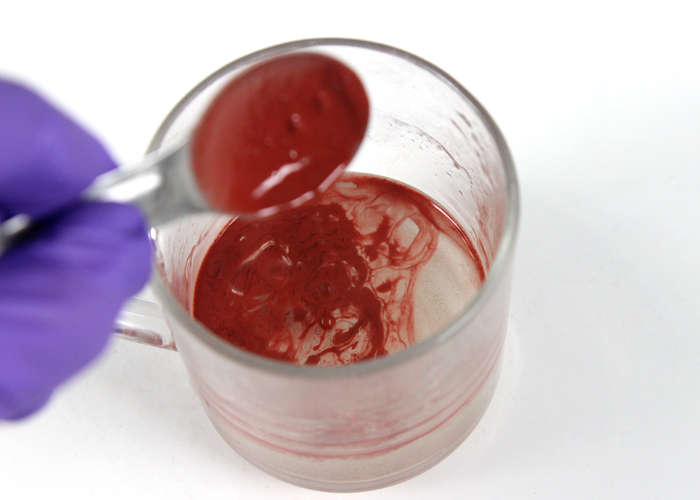 SIX: Then, spritz the red soap with 99% isopropyl alcohol to help the layers stick. 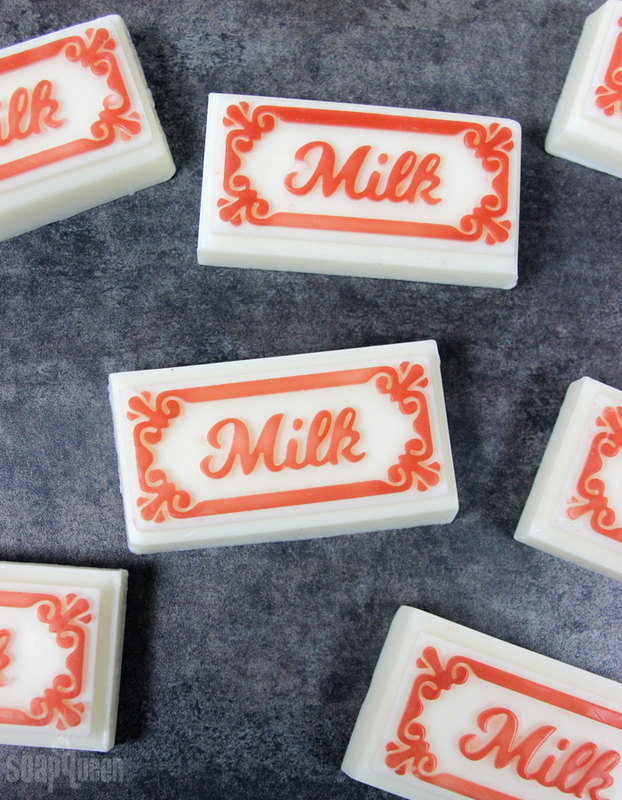 Slowly and carefully pour the white soap in the mold and spritz with alcohol to pop any bubbles. Let the soap harden for 4 hours or overnight. Unmold, cut into 8 bars along the score marks and enjoy! To avoid glycerin dew, wrap them immediately in plastic wrap or another airtight packaging option.